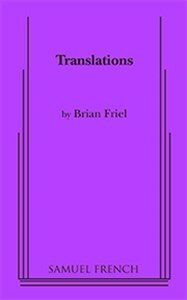 Translations is a three-act play by Irish playwright Brian Friel, written in 1980. It is set in Baile Beag (Ballybeg), a Donegal village in 19th century agricultural Ireland. Friel has said that Translations is "a play about language and only about language", but it deals with a wide range of issues, stretching from language and communication to Irish history and cultural imperialism. Friel responds strongly to both political and language questions in the modern-day Republic of Ireland. He said that his play "should have been written in Irish" but, despite this fact, he crafted carefully the verbal action in English which makes the dynamics of the play come alive, and brings its political questions into true focus. Baile Beag ("Small Town") is a fictional village, created by Friel as a setting for several of his plays, although there are many real places called Ballybeg throughout Ireland. From the acclaimed playwright of Faith Healer and Dancing at Lughnasa, this hauntingly lyrical play is about nothing less than language as the soul of a nation. Set in 1833 in Ireland, it tells of the British army's campaign to replace the native Gaelic place names with English ones in an attempt to end centuries of fighting by setting up a political union based on a common language. Against a beautiful backdrop, Lieutenant Yolland, a British soldier, falls in love with Maire, a peasant girl, and with Ireland. Their romance sparks displeasure and anger in the Irish and English alike, and when Yolland goes missing, the mutual revenge taken threatens to tear the countryside apart.